Charlene Starck avoided Wednesday's persistent rain, but she ended up wet anyway. Soaking, actually. The paddler rolled her kayak in the flesh-numbing Yukon River rapids. Many times. She also balanced her stubby kayak in the white-capped waves. In fact, Starck did her boat tricks well enough to win the Women's Advanced Freestyle category at the eight annual Whitehorse Whitewater Rodeo. And she provided the color commentary. The event, which lured about 70 kayakers and canoeists to the Yukon River water intake off Nisutlin Drive, was impressive, she said in a telephone interview Thursday, well after she'd dried off and warmed up. "Not very many towns have that right downtown. Whitehorse is totally lucky that they have the intake," she said. "I think it gets everyone that's watching interested and they might go out and try kayaking." The rodeo was well organized, she said. "It's hard to organize that many people, but it was very well done." 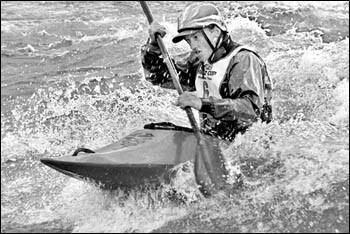 Starck, a member of the Canadian National Kayaking Team, has been paddling since 1994 and will represent Canada at the World's in New Zealand, this December. Her first competition was at the Worlds in 1995. There was an open spot on the team so off she went, to Germany, she said. She found out three weeks before she had to compete that she was going. "I loved it, but it was very scary," she said. "I don't recommend the World Championships for anyone's first tournament. "People were really supportive and helped me out a lot." And its has been that way all along: "A friend got me to try it (paddling) out at a local paddling clubä and I loved it. "I fell in love with it the first time I went down the river." The national team includes three paddlers from western Canada and three from eastern Canada. Starck had to participate in the team trial rodeo in Kananaskis, Alberta, to qualify for the national team. The B.C. elementary teacher lives in Whitehorse during her summer's off. She has been a raft guide for Tatshenshini Expediting, worked for the Special Olympics and now occasionally teaches kayaking for Tatshenshini. She believes kayaking is heading in the same direction as other extreme sports - up. "I think it's becoming way more mainstream. I think a lot more are getting and will get involved." Freestyle kayaking is becoming so popular, not only because it's a high- adrenaline sport, but because it's fun, she added. "Once you do your first roll or your first ender, it's a good feeling for people." Canadians have been very successful in the sport, Starck noted. In 1997, Canadian paddlers won golds for the men's and women's. "I think we're definitely at the same level as the States and the European countries. I think Canada's doing awesome." Starck learned her tricks by watching videos and studying other paddlers, and she trains by paddling with her friends and mountain biking. She recommends that would-be kayakers take lessons to decide if they truly enjoy the sport before buying all the equipment and taking on all the stresses. Make sure you know where your limits are - for safety reasons, she said. "Actually, the best place to learn is when you go to rodeosä you learn from all the people that are inventing moves," she said. Meanwhile, rodeo chairperson Catherine Doyle is also very happy with this year's event. "I think it went very well, everyone had a lot of fun," she said.